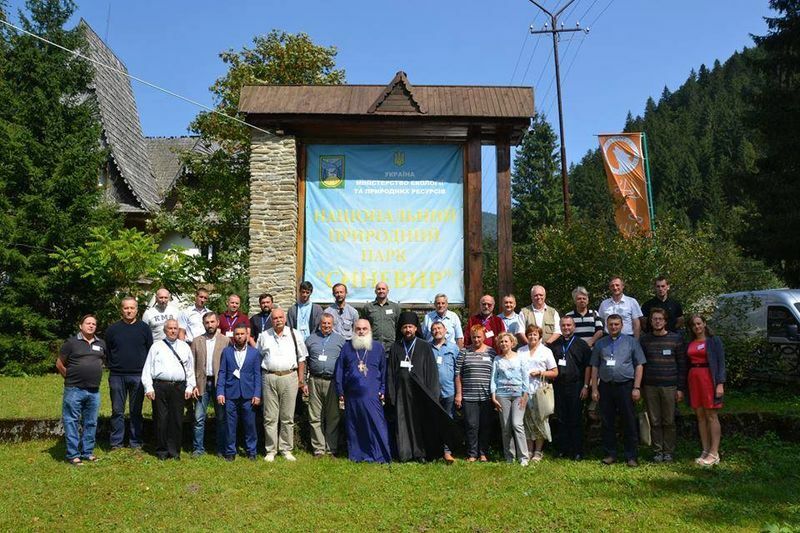 The participants of the working meeting discussed a number of issues of future cooperation and organization of tasks within the framework of the IRCEF (International Religious and Civil Environmental Forum of Eastern Europe) in the format of presentations, discussions and informal communication, including visits to the nature protection objects of the National Park Synevyr. The use of the national park’s territory as a platform for professional communication made it possible to identify significantly relevant points of cooperation on climate protection and cooperation in the IRCEF format. • The participants emphasized that the Forum needs to concentrate on major sectors of environmental activities, such as “biodiversity”, “energy”, “theology”, “sustainable lifestyle” and “water”, based on models of international organizations working in this field. • The creation of a specific committee on environmental theology (within the framework of the IRCEF program declaration) to be led by Prof. Matthew Temple a biologist and priest from the Carmelite Order (USA). The specific goal of this committee will be the development and dissemination of theological grounds for the environmental values of the Responsibility for Creation and cooperation different religions. This committee will complement the activity of other committees in the IRCEF structure. • This specialization is necessary for other committees that interact and complement each other based on their own specializations. • The establishment of interaction between IRCEF member organizations in the implementation of climate / environmental projects that envisage their joint activity was acknowledged. One of the relevant areas of activity that requires specialization and mobilization of efforts within the framework of the Forum's work is climate protection. The importance and unity of this problem was illustrated at the levels of both Transcarpathia in Ukraine and Eastern Europe. The primary objective of IRCEF in the field of climate protection is work on practical steps and methods for dissemination of climate protection issues to the population by joint efforts of the Church and NGOs. Participants emphasized the importance of comprehensive climate protection activities involving authorities, local government, business, media and other influential groups to consolidate the projects being developed. The participants agreed on the need to create a Climate Protection Committee Program in Eastern Europe based on the IRCEF. This should include provisions for both the organization of Committee work and for working projects on climate protection of IRCEF participating organizations. The working Group believes that projects should be implemented as a comprehensive program at the level uniting the efforts of the Eastern Partnership countries to ensure the sustainable development of the entire region. Important features of the Committee Program are the strategy of establishing cooperation with the main EU structures and the state bodies of the Eastern Partnership countries (European Commission, European Parliament, ministries, governments, etc.) and the establishment and maintenance of a communication platform based on the Committee for all parties interested in climate protection. Such a level of interaction is necessary to ensure the integrity of the consistency and systemic efforts to protect the climate in the whole region of Eastern Europe. • Coordination of project activities and selection of climate projects proposed by IRCEF member organizations, their integration and synchronization for implementation at the level of the Eastern Partnership countries. • Presentations by the IRCEF committee at state and international events dedicated to climate protection for finding new partners, promoting their projects. • Informational and educational activity on climate issues within IRCEF and beyond to meet this component in the work of both non-state and religious organizations in their work with the public. The importance of codifying the legal aspects of climate protection in the work of the Committee and the importance of its efforts to lobby for relevant changes in the legislation and activities of local authorities and at the legislative level were also highlighted. 5. annual strategic sessions to update the program of the Committee’s work. • Victor Karamushka, Candidate of Biological Sciences, Associate Professor, Head of the Department of Ecology of National University Kyiv-Mohyla Academy, Kyiv, Ukraine, and presumably Head of the Committee. • Archimandrite Adam (Vakhtang Akhaladze), Doctor of Medicine, Professor, Rector of the University of St. Tamara of the Georgian Patriarchate, Tbilisi, Georgia. • Svitlana Boychenko, Doctor of Geographical Sciences, Associate Professor, Institute of Geophysics at Subotina National Academy of Sciences of Ukraine, Kyiv, Ukraine. • Muhamedov Abdul Karim, Imam of Khmelnytsky Oblast, representative of Spiritual Administration of Muslims of Ukraine in Western regions of Ukraine. • Sergey Yushkevich, NGO "Center for Environmental Solutions", Minsk, Belarus. • Fr. Roman Romanovich, a consultant on environmental issues of the Kyiv Archdiocese of the UGCC at the Bureau of Ecology of the Ukrainian Greek Catholic Church. • Mykhailo Bilanych, member of the Commission on Ecology of the Mukachevo Greek Catholic Eparchy. Participants agreed to work out a format for cooperation and clarify the Committee’s program. The first projects for examination and implementation were proposed and approved. Public presentation of the Committee and its activities for the media and partners are to be prepared and conducted. To do this, during the working meeting examples of current and local projects promoting climate protection, activities submitted with the participation of IRCEF were considered, the possibilities of implementing them in other participating countries were discussed, and proposals for optimizing such work were taken into account. The countries agreed that, under the format of each project, organizations will seek partners for implementation at the local level and at the same time will work to launch consolidated initiatives at the international level. For this, with the consultative support of NABU (Germany) experts, the main parameters of the proposed projects of the participants, important for joint work and their integration into the overall program, were clarified, and IRCEF experts outlined the important parameters for the organization of project support in the field of climate protection. The need for systematic information support (in particular, the media) for all activities of IRCEF in the field of climate protection and their adaptation to targeted groups of the population (e.g., children, youth, believers, students, etc.) was recognized as a separate task. The emphasis was on the development and production of specific information products, for the presentation of IRCEF climate initiatives in the media, and the development of an advertising and media campaign for direct information promotion of the project on IRCEF resources in the Internet. Working meeting participants received detailed information on the work done by the initiative group with the aim to find funding for the IRCEF program. They also approved the planned steps in this direction, in particular, a series of meetings with Mrs. Rebecca Harms (member of the European Parliament), the leadership of the Ministry of Nature Protection of Germany (BMU), Ministry of Economic Cooperation of Germany (BMC) and other state and non-governmental organizations. Working meeting participants stressed the importance of practical direct communication about several new projects which have already been generated. The formulations of these will form the basis of the “project bank” of the IRCEF Climate Protection Committee. Also, they will serve as the basis for the formation of its working program both at the implementation level in individual countries participating in the project, and in the form of consolidated work at the level of the Eastern Partnership.